Europe's energy-intensive industries such as cement and steel are in 'urgent need' of innovative carbon capture and storage (CCS) technology if they are to reach EU-wide emission targets by 2050, a new report has found. 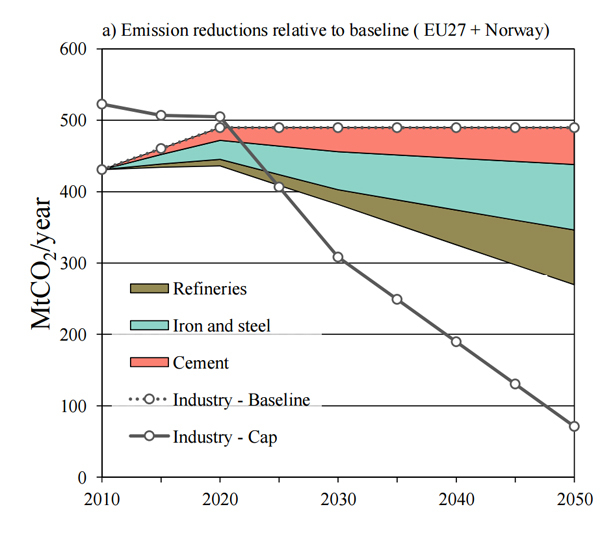 The report, developed over several years by researchers at Chalmers University of Technologyin Sweden, concludes that there is the potential to reduce emissions by between 60%-75% from large industry sources if the full potential of emerging CCS technologies was realised and implemented; a target that is in line with the emissions targets set for 2050. The thesis warns of a 'ticking clock' for these industries due to the plants’ long life span and the drawn out time it takes to introduce new technology. Rootzén warns that there is only “a few investment cycles left” before 2050. The continued high demand for bulk products like cement and steel means that the sector needs to find new ways to cut back on emissions without stifling production. The researchers have called for the establishment of a large-scale demonstration of the entire CCS chain from capture to storage, a move that would only have a ‘marginal effect’ on the final price of end-products such as cars or buildings. Professor Filip Johnsson who has been leading the research said: “It is easy to say that we should achieve zero emissions, but this requires that we take the issues seriously and are given the opportunity to demonstrate new technologies; CCS as well as other mitigation options. The UK Government has reiterated its support for the implementation of CCS despite energy giant Drax pulling out of a consortium to build the White Rose CCS project in Yorkshire. The UK has also made the potential sites for carbon storage projects freely available to the public in an attempt to encourage more companies to invest in CCS by reducing initial costs and making information more readily available.